Happy Lunar Imbolc! Lunar Imbolc is the New Moon in Aquarius that happens at 1:04pm PT today, is the cross quarter holiday that is half way to Spring equinox. This is also the Chinese Lunar New Year that welcomes the year of the loyal, generous and jovial Pig. Imbolc is Midwinter when the first signs of the Earth’s re-birth into spring begin to show. The brave heralds of this, crocus, primrose and snowdrops, push up into the harsh weather to bring us courage that the winter is losing its grip and new life is quickening. Imbolc is dedicated to the Goddess Brigid who is the Goddess of the forge, fire, inspiration and healing. She creates the spark of life from her forge that brings forth hope and new beginnings. Imbolc is a fire festival, lit by the forges of Brigid that spark new creations and desires. 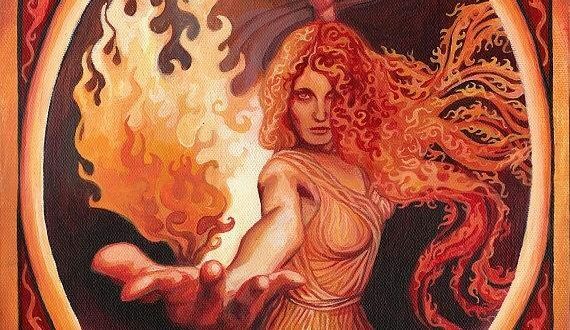 It is a powerful time to honor the fire within us, the fire of passion and the fire in our hearths that warm us in this dark cold time of the year. The holidays are WAY over and Spring is coming, so this is the time to savor the last of the quiet wild dark and let it gestate the seeds of light. Rest up and dream the dream awake. Aquarius is the sign of the pursuit of consciousness at all costs. This sign is the intellectual one that has brilliant structured ideas that serve the greater good. It is innovative, eccentric and the one that has cutting edge ideas that blow everyone’s mind. So with the Sun, New Moon and Mercury all in Aquarius right now, this is an excellent time to pay attention to the insights that will spark creation during this week. What do you want to spark to life in these last days of the winter hibernation? What feeds your central fire and your community’s fire? What ideas do you want to use the bellows on to fan to life? Enjoy and savor these precious gestation days as the Spring will be bouncing around us before you know it. Remember, part of honoring these creative days is the magic of saying “no” to too much. Rest up and dream the dream awake.